Glenglassaugh [pronounced glen-gla-soch] is a distillery located in the north east of Scotland just beyond the boundary of the Speyside region, and it sits nestled between the coast of the North Sea and the Burn of Fordyce. The distillery was built in 1875 and it subsequently was in operation for almost 100 years, closing its doors in 1986 after an economic downturn in the whisky industry during the 1980’s (which also saw the closure of some other famous names, such as Port Ellen, St Magdalene and Brora to name a few). Glenglassaugh remained silent for just over two decades but in 2008 it was purchased by an independent group of investors and then in 2013 by the BenRiach distillery. The once silent distillery is now revived, and with this revival comes a few interesting expressions which adopt a refreshing twist to whiskies that tend to come out of Scotland. Three of those expressions include the Revival, Torfa and Evolution. In this review Malt Mileage takes a look at the Glenglassaugh Revival. Glenglassaugh Revival is the first malt from the re-furbished Glenglassaugh distillery. It is aged in first and refill casks, finished in 1st fill Olorosso sherry butts for 6 months and then bottled at 46% alcohol volume. These sherry butts appear to give this whisky an interesting sulphur rich character that projects an associated spent firecracker or cap gun smell, and this character prompts a short explanation why – contrary to what whisky legend Jim Murray might say – sulphur ain’t that bad! Some sherry casks are “disinfected” by burning sulphur candles inside them and this practice, surprise surprise, infuses the wood with the aroma of sulphur dioxide (that firecracker, cap gun smell). In his mediocre rating of Glenglassaugh Revival Jim Murray takes issue with the use of present day sherry butts saying they should be avoided “at all costs” because he says the chances of running into sulphur is high. In my opinion, whether or not sulphur is palatable is a matter of taste. Jim Murray does not like it, but there are numerous whiskies I have tasted which are accentuated by the sulphur influence from oak casks and it is this influence that gives them an interesting twist. Copper stills are used to help remove sulfides from new make spirit, but the right amount of sulphur can help give a whisky its unique character. Some people may be sensitive to sulphur, but for the rest of us it may be hated, loved or tolerated – it is just a matter of taste. To say that a whisky is bad because it contains the smell or taste of sulphur in my respectful view misses the point of whisky as a subjective experience. My Dad abhors the smell of peat, so he thinks all peated whiskies are “bad”. Is he right? Of course not! Most whisky lovers, myself included, live for a mouthful of peat and burning hospitals. That’s whisky. Glenglassaugh Revival offers some chocolate, raisin, Spanish style rum notes with the faint hue of drying nutty Olorosso and honeyed nuts alongside sweet caramels and diluted ginger ale. I am not sure the interplay between the distillate and the bourbon/sherry cask influence works as well as in the Glenglassaugh Evolution, but it is still very good. The sulphur also seems to give it the hum of struck matches throughout, and – whether from the cask or distillate – a more “meaty” finish that is difficult to describe with descriptors alone. Honey glazed leg ham lingers with those struck matches, the drying oloroso and caramels on the finish. Overall, Glenglassaugh Revival is a young, sweet, sugary, sulphur infused whisky that has a very interesting flavour profile that I think is improved and given an interesting twist by the sulphur treated oloroso sherry butts. It is not a bad first attempt by the new Glenglassaugh distillery, but in my view just falls behind their second attempt, Glenglassaugh Evolution – definitely an evolutionary step up from the Revival. I wonder if Glenglassaugh meant this in the name? 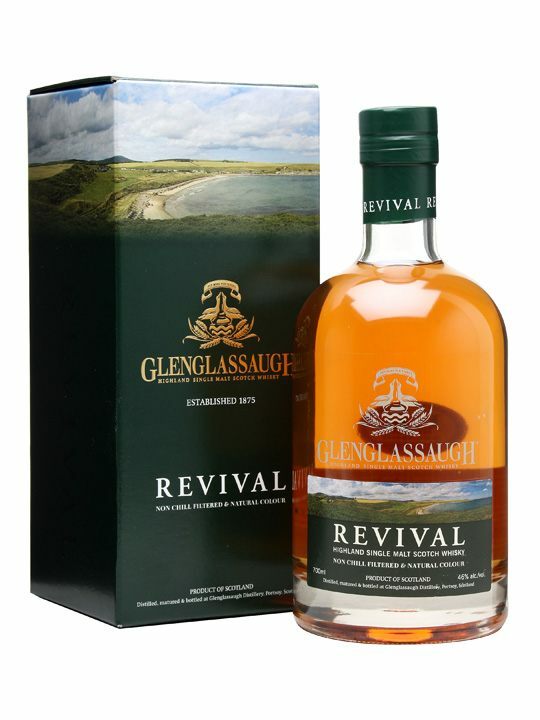 Glenglassaugh Revival is available for $99 at World of Whisky. This entry was posted in Highlands and tagged Glenglassaugh, Glenglassaugh distillery, Glenglassaugh Revival. Bookmark the permalink.